I have had this large, empty, triangular space in the back corner of the yard. It has remained untouched since I moved here twenty-six years ago. It didn't matter since it was hidden behind a grove of large rhododendrons and it couldn't be seen from the road. Turning it into a garden presented several problems. A closed canopy of large Douglas and Grand Firs puts it in deep shade all day. The soil is classic Pacific Northwest glacial till. It is nutrient-poor, composed of sand, rocks and clay, and devoid of organic material. It does not hold moisture at all. 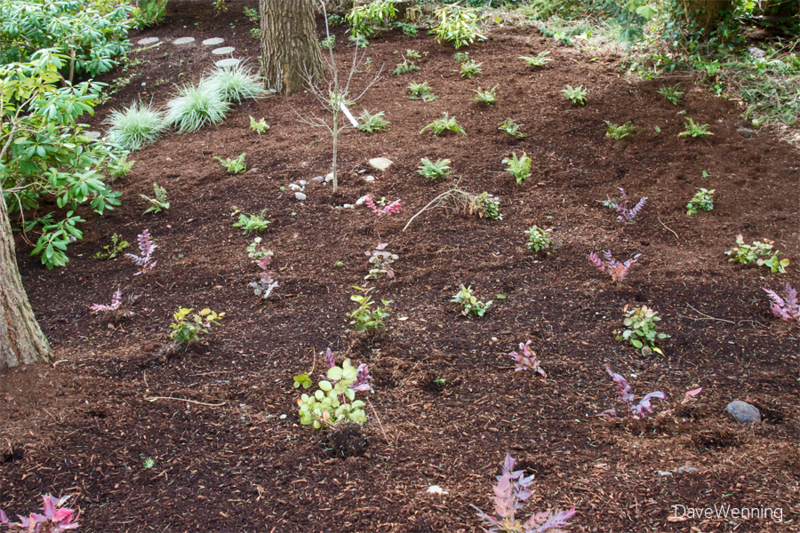 Regardless of rainfall or watering, scrape away the bark mulch and you will find a desert underneath. Besides creating full shade, the big trees are also efficient resource hogs. They will quickly consume any nutrients or water that does manage to get into the soil. They use a network of rootlets just under the surface that reaches out far from the tree. Experiments with ground covers on the back bank to the driveway all ended with failure. A lot of research didn't help either. Drought-tolerant plants usually require some sunlight. 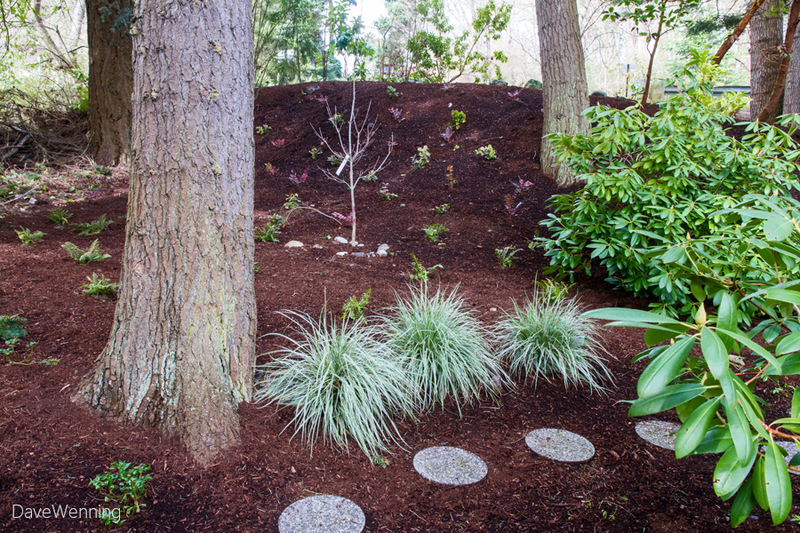 Most shade plants need moisture. What I needed were drought-tolerant plants that would thrive in deep shade and these are not easy to find. 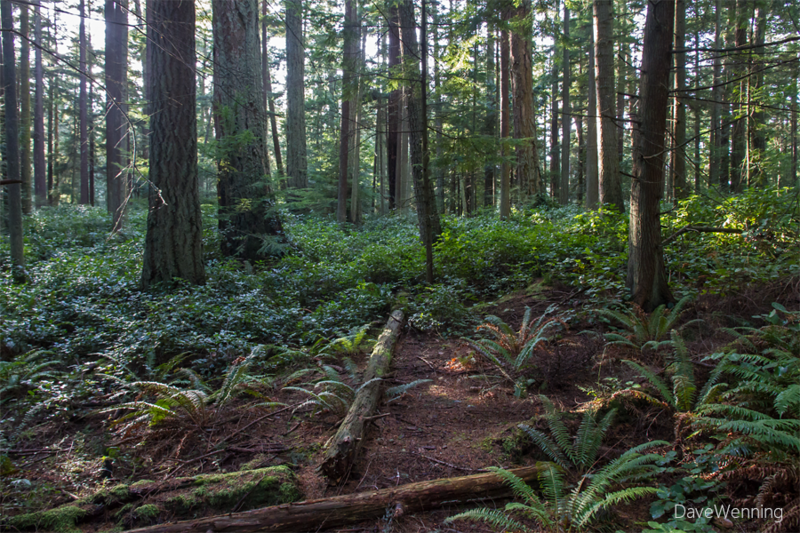 What to do with this garden hit me during a hike in Deception Pass State Park. 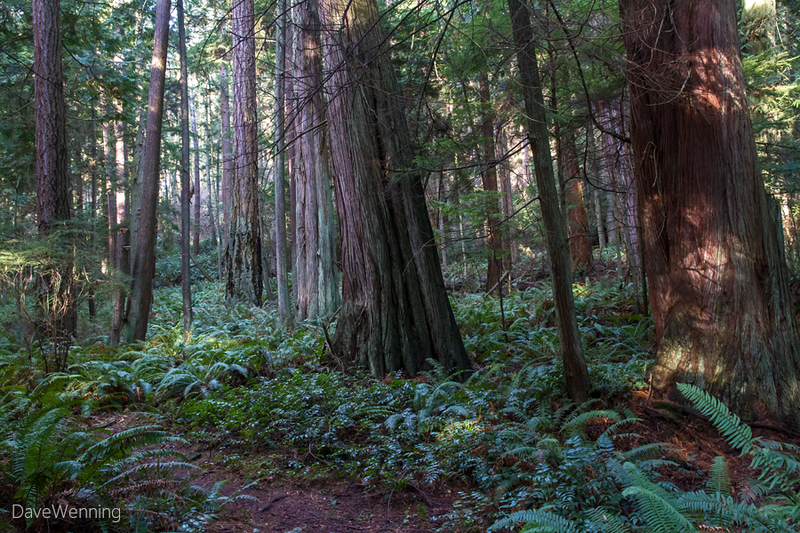 I realized that in the deep shade of the old growth canopy, the forest floor was a lush botanical paradise. The solution to my garden problem was all around me. The rainfall, light and soil conditions were identical to my yard. The plants I see on every hike are also indigenous to my property. Native plant gardening is a passion. Why hadn't I thought of this before? Much of the property actually looked like these photos before it was cleared for building. I now have this space completely planted. This is the new garden viewed from the small back lawn. The grass tufts in the foreground are Japanese Sedge (Carex oshimensis 'Everest'). I planted them three years ago and I've been amazed how well they have done in the conditions here. They have this silvery-green look all year, adding some brightness to the shade. Also important, the deer won't touch them. The rhododendrons have also done well in this part of the yard. If they are babied for a couple of years, they will come to thrive in these austere conditions. 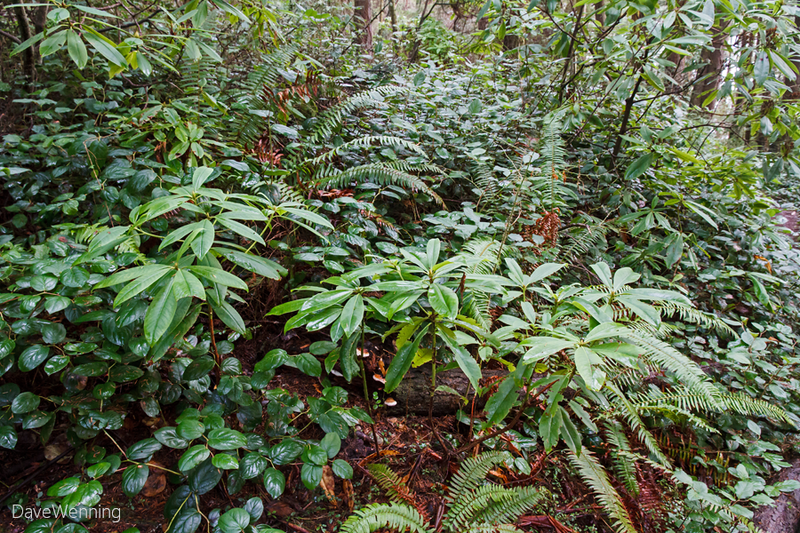 Like the native rhodies, they naturalize beautifully in the understory of the firs. A fungal symbiont in their roots helps provide moisture and nutrients. 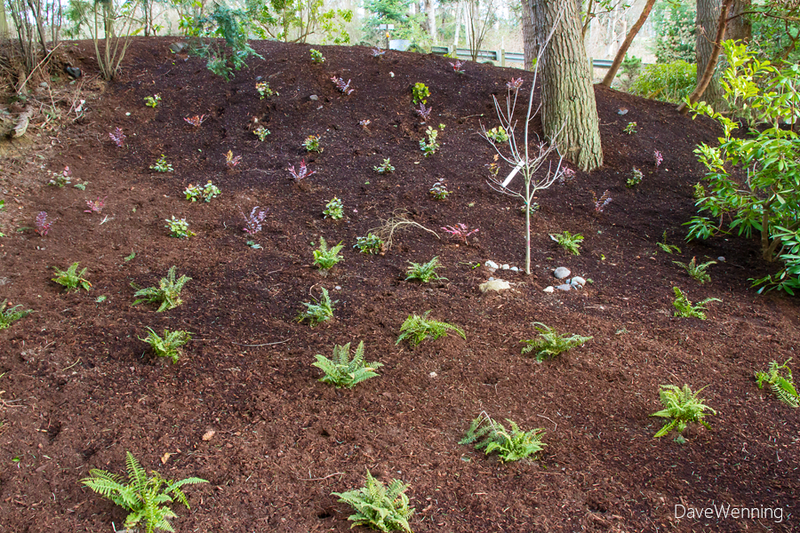 I chose three evergreen forest floor natives for the new plantings. I see these all around me on every hike in the park, and all three are indigenous to the property. The flatter area behind the grasses is planted entirely with Western Sword Ferns (Polystichum munitum). These will eventually grow up to waste tall covering the ground completely with dramatic sprays. Under the big trees, they take on the look of a shag carpet. For the bank in the background, I selected Salal and Longleaf Mahonia. Salal (Gaultheria shallon) is a cousin to rhododendrons. It is very common to find drifts of salal around the bases of Douglas Firs. Longleaf Mahonia (Mahonia nervosa) is the low growing little brother to Oregon Grape (Mahonia aquifolium). 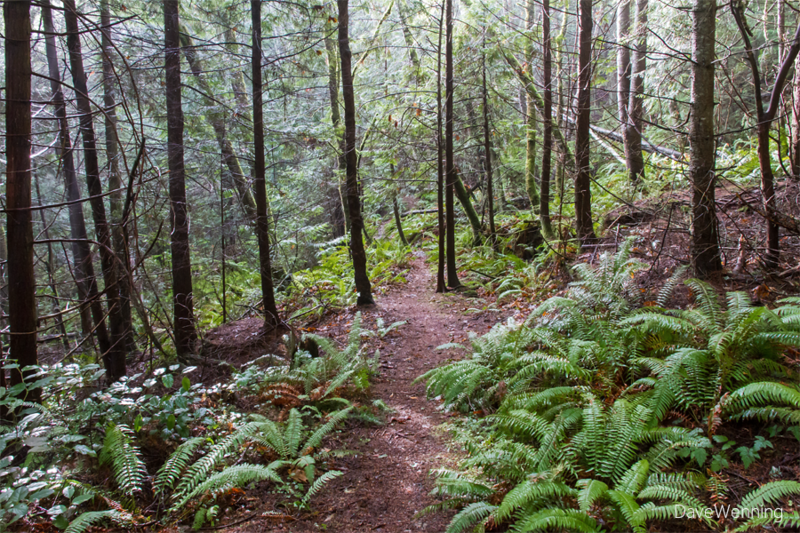 It loves to grow along the edges of trails in Pacific Northwest forests. The leaves turn a reddish bronze color during the winter. I have native M. nervosa coming up on its own among the rhododendrons. Finally, I wanted to provide this garden with a centerpiece. I chose a Pacific Dogwood hybrid called 'Venus' (Cornus kousa x C. nutallii). It has the giant blooms of the native Pacific with the disease resistance of the Korean Dogwood. The light gray bark will sunburn out in the open, but it shines in the shade of the canopy. I had one in the same spot before, but the logging crew that worked on the big trees damaged it. It has already proven to thrive in the poor light and dry conditions here. Looking down from the driveway, the new garden doesn't look like much right now. It is just a large space with a lot of little plants stuck around. I admit, it's not very inspiring or attractive at the moment. But give it some time to naturalize. The ferns will get large and the Salal and Mahonias will begin to spread through underground rhizomes. The plants will take on different heights. There will be a variety of green shades with spots of reds and yellows. The firs will drop some branches among them. Maybe I can get some moss started. In time it will begin to look like the photos from the state park above. Or at least, that's the plan. I know it will be better than the bare, empty ground I had before.